Project Project: One month and two days to go. 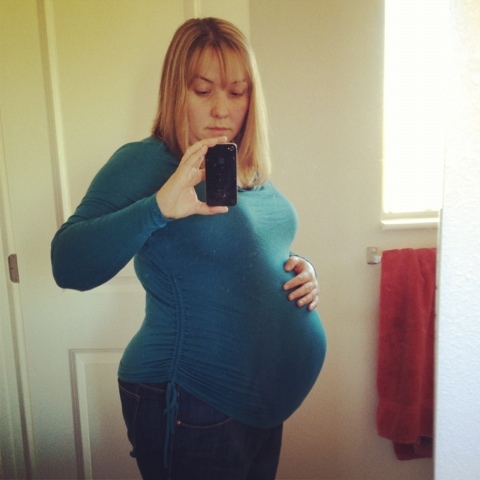 I happened to have my phone with me when I was getting dressed, so I snapped this photo of me and the bump (and our inglorious bathroom) to show you what I look like these days. Huge! My doctor keeps congratulating me on my enormous babies, and I keep thinking he's insane. What's important is that we're all healthy, and so far, so good. I can't believe we're so close! Yep. That's about what I look like at the end, too. :) But it's wonderful. You look great. Love the hair and your shirt is super cute. Maternity clothes have seriously improved in the last few years. What a weird thing to congratulate somebody on! You'd think as a gyno he would have figured out to just tell every pregnant lady that they looked so slim and fantastic. Although you DO look fantastic and I am jealous of those bangs you are rocking.